First published in 1988, Peter Brown's The Body and Society was a groundbreaking study of the marriage and sexual practices of early Christians in the ancient Mediterranean and Near East. 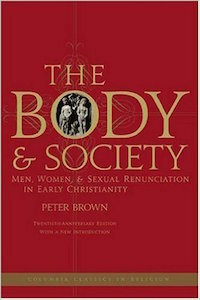 Brown focuses on the practice of permanent sexual renunciation—continence, celibacy, and lifelong virginity—in Christian circles from the first to the fifth centuries A.D. and traces early Christians' preoccupations with sexuality and the body in the work of the period's great writers. The Body and Society questions how theological views on sexuality and the human body both mirrored and shaped relationships between men and women, Roman aristocracy and slaves, and the married and the celibate. Brown discusses Tertullian, Valentinus, Clement of Alexandria, Origen, Constantine, the Desert Fathers, Jerome, Ambrose, and Augustine, among others, and considers asceticism and society in the Eastern Empire, martyrdom and prophecy, gnostic spiritual guidance, promiscuity among the men and women of the church, monks and marriage in Egypt, the ascetic life of women in fourth-century Jerusalem, and the body and society in the early Middle Ages. In his new introduction, Brown reflects on his work's reception in the scholarly community.